Now that the kids are back in school, it is important that they start each day the right way by eating a healthy breakfast. Some studies have shown that nearly half of all children do not eat breakfast before going to school. This puts them at a disadvantage both physically and academically. For information about the advantages and disadvantages of eating a healthy protein-rich, fiber-filled breakfast every single day, CLICK HERE. Every week this month, we will provide some "take-and-go" recipes that have both protein and fiber and that can either easily be made in the morning or in advance (and frozen). 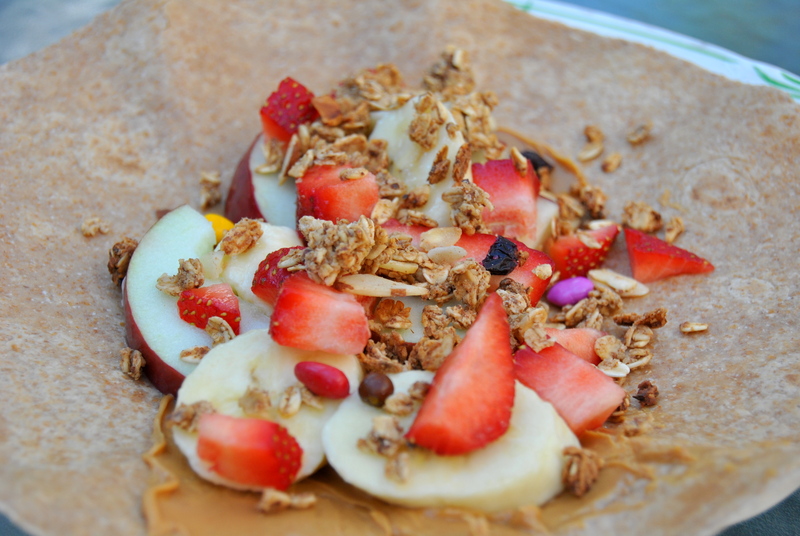 This week, we introduce our Power Breakfast Tortilla and Homemade Whole Grain Granola. 1. Slice Banana and Apple and place in a small bowl with juice of 1 fresh lemon (to prevent oxidation, or browning, of fruit). 2. Spread Sunflower Seed Butter (or Peanut Butter) in the center of tortilla. 3. Top with fresh fruit (banana, apple, strawberries). 5. Fold Tortilla (one end first, then roll) and Enjoy! In a large bowl, mix together the oats, oat bran, flax seeds, brown sugar, and cinnamon. In a separate medium bowl, whisk together the apple juice, maple syrup, vanilla and coconut oil. Add the wet ingredients to the dry ingredients and mix until well-combined. Fold in nuts. Mixture should be a little "clumpy". Spread mixture evenly over a very large parchment-lined large baking sheet (or two medium-sized baking sheets). 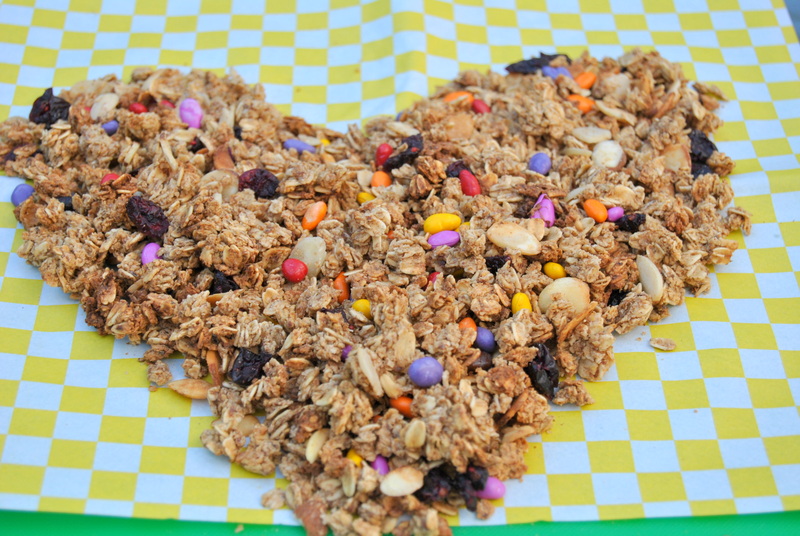 Bake for 30-45 minutes - stirring every 15 minute - until granola is just golden brown. Remove from oven and stir in dried fruit. ©2013 Kids Heart Felt Health Inc.
1. Place oats and almonds in a blender and blend on high until fine like flour. 2. Remove from the blender and add in baking powder. 3. Place dates, oil, eggs, bananas, yogurt and vanilla in the blender and blend on high until combined. 4. Pour into oat mixture and mix until just all is combined. 5. Add in chips, blueberries, or raisins if using. Pour into cupcake liners in a muffin pan or into a greased loaf pan. 6. For the muffins bake at 375F for 20 minutes and remove and for the loaf bake at 350F for 40 minutes and then remove. Eat and enjoy! *If you use a frozen banana, pop it in the microwave for 1 minute and add to recipe (make sure to retain all juices from banana). 2. In a medium bowl, whisk together wheat flour, white flour, flax seed, baking powder, baking soda, and salt. 3. In a separate bowl, add brown sugar and coconut oil and combine thoroughly with a fork. Then, add the banana (including excess juices from microwaving). Next, add the eggs, vanilla, and milk and combine all ingredients thoroughly. 4. Add the dry ingredients to the liquid ingredients until just combined, being carefully not to over-mix (over-mixing creates muffins that are very dense and dry). 5. 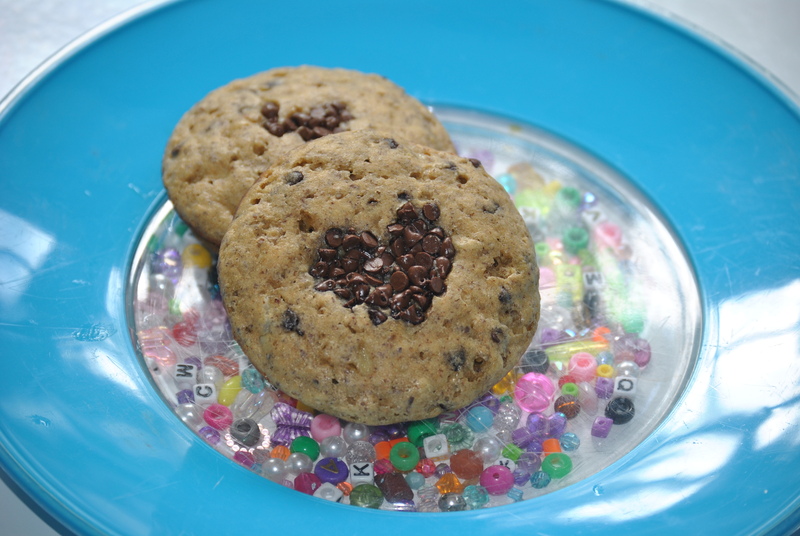 Gently add chocolate chips, but do not over-mix. Sprinkle a few extra chips on top of muffins for decoration. 6. Spray muffin tins with cooking spray. 7. Bake for 15 minutes (or until a knife inserted in center comes out clean). Let muffins rest for 5 minutes before removing them from muffin tin. 1. Place oats in a skillet and toast on Medium for 4-5 minutes. Set aside. 2. Place eggs, milk, and cinnamon in bowl and mix until combined. 3. Spray skillet with cooking spray and turn heat on Medium. 4. One at a time, place each bread slice in egg mixture, turn over, then scatter toasted oats on top. With the oats facing up in egg mixture, use a spatula and flip it into the heated skillet so oats are facing down. Sprinkle top of bread with more oats and flip again when underside of bread is golden brown. 5. When toast is golden brown on both sides, remove from pan. Repeat with remaining bread. 6. 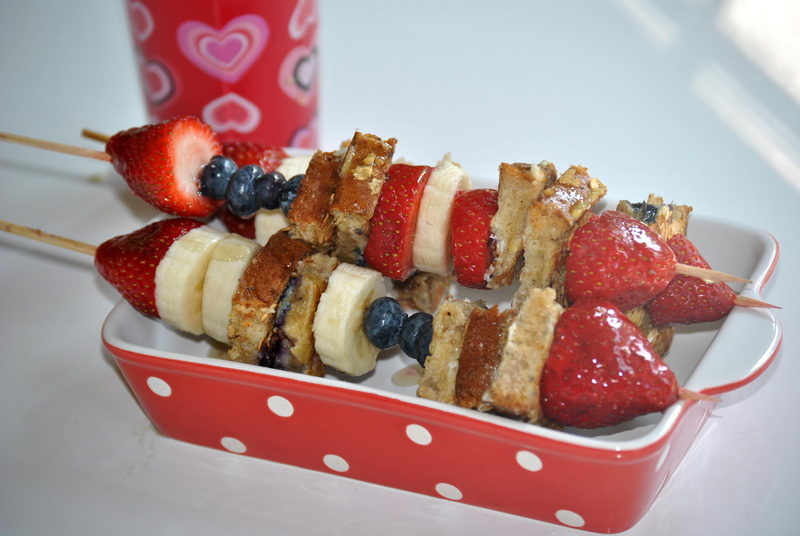 Cut french toast into cubes and place on skewers, alternating with fruit. 7. Serve with a small amount of maple syrup (the fruit is sweet enough). ©2013-2018 Kids Heart Felt Health Inc.